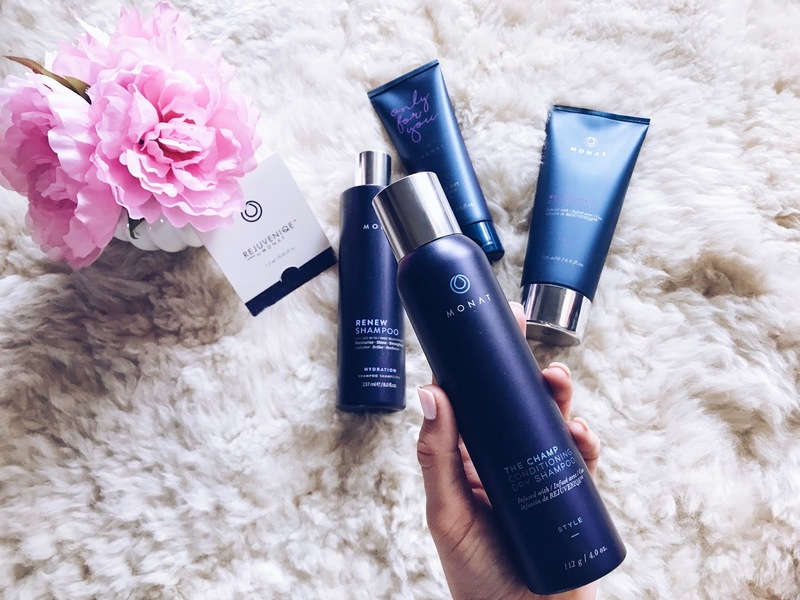 A couple of weeks ago Monat market mentor Whitney contacted me about trying some Monat hair products. I've heard a lot of /mainly/ good things about this line, so I was excited to try! We had a little hair chat and she decided to send me shampoo and conditioner for volume, dry shampoo, and blow out cream. Before I get into my review, I'll explain why I said I hear "mainly" good things about Monat. After I posted that I was about to try this brand, a few girls messaged me (thank you!!) and told me to be careful because apparently people are having very bad reactions to these products. I hadn't heard about this so I talked to Whitney. She told me that her entire family has been using Monat for the last 8+ months and no one has ever had an issue. Apparently there are some jealous stylists that sell a competing brand of hair products and are slandering Monat to hurt sales. You can read about it here. Let me say, I wanted to love this line! But, I wasn't too impressed with my first try. Anywho, Whitney sent me an oil treatment to use before my first wash. After letting that sit for about 20 minutes, I washed twice (to get all the oil out, the second wash gets very sudsy) and then used the conditioner. I'm used to very slick hair after I put in conditioner, but Monat conditioner doesn't feel this way. I think that might have caused me to use too much. Before blow drying my hair I also used the Blow Out Cream. I don't know what I did wrong but my hair honestly didn't feel great after it was dried. It felt very heavy and like there was a lot of product in it. I also used the Monat dry shampoo until the next time I washed my hair and wasn't very happy with it either. However, I didn't start out on a great food anyway. I used my normal Tresemme for a week or two and tried Monat again. No oil treatment this time, but I washed twice and tried using less conditioner than last time. I didn't use the blow out cream either. After drying my hair, it felt better than the last time, but I'm honestly still not sold. It still felt like there was product on my scalp and roots, and my hair wasn't as soft/easy to brush out. Maybe because the shampoo/conditioner I tried is for volume?? I'm telling you, I really wanted to love this stuff, especially for Whitney, because it was so sweet of her to send me all these goodies!! And even though I unfortunately wasn't blown away, I definitely don't hate it. I still encourage you to try the Monat line if you've ever been interested! They have a great 30 day money back guarantee. Click here to browse the Monat line. Thank you again, Whitney! Click here to shop through her!